THERE IS ALWAYS MORE TO DO THAN TIME TO DO IT! That would appear to be a truism both at home and at work. “There’s always tomorrow” is increasingly unacceptable, given increasing demands from service users and pressures on budgets (though it may suit some to let the ironing pile and the lawn grow…). Waste occurs in everything and the trick is to recognise it and then change the operation to eliminate or reduce it. Waste shows itself as cost to the business, which means financial losses. It also steals time, which means fewer things get done, which in turn means frustrated service users. At Souterford Road, the street cleansing teams of Inverurie, Ellon and Huntly have been looking at the way they work and the first milestone of this journey to excellence has just been achieved: following a rigorous programme of self-audits and workshops the team has achieved BRONZE status in the Bronze-Silver-Gold assessment used in ‘Kaizen for Daily Improvement’. For the street cleaning team to achieve ‘Bronze’, they had to achieve at least 90 out of a hundred points. In February, their assessment of their progress yielded an impressive 94 points – and the team continues to take action to get the remaining six. 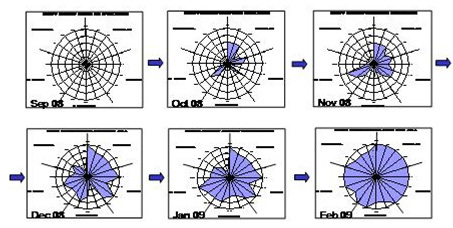 The radar charts below show their progress over six months. The scores, of course, are only a reflection of workplace behaviours, which in turn are felt by service users, as the quality of service provision continues to rise. Embedding Continuous Improvement into our thinking, such that it becomes second nature to constantly review and improve the way we do things, is how Aberdeenshire Council will enhance its service performance for its clients. For team it means being listened to, being involved, removing frustration from the job and feeling valued.